Adding cover crops to your farming operation can be a great way to reduce soil erosion, improve soil quality, and provide forage for livestock. Cover crops need to be seeded in a timely manner to allow sufficient growth before winter if the desired results are to be achieved. Waiting until after soybean or corn harvest to plant a cover crop does not allow enough time for the cover crop to grow before winter and the full benefits of cover crops. Because it is difficult to get cover crops seeded early enough and a large interest in cover crops the Allamakee SWCD is offering producers an opportunity to have cover crops aerial seeded this summer. We are working with Klinkenborg Aerial Spraying based in Parkersburg, IA and Hall Roberts’ Son Inc. in Postville to provide the seed and seeding services. The goal is to aerial seed the cover crops between August 15 and September 1 as this will allow sufficient time for the cover crops to grow before winter. The cost of the seeding will be $15 per acre with a minimum charge of $150. The seed costs will vary by the seed mix selected. You may select from 3 seed mixes, 2 bushels of winter rye per acre, 2 bushels or organic winter rye per acres, or 2 bushels of oats and 5 lbs of tillage radishes per acre. These seed mixes will meet the requirements of the EQIP and CSP program, depending on which activities you have in your contract. You do not have to be enrolled in the EQIP or CSP to be eligible for the cover crop. 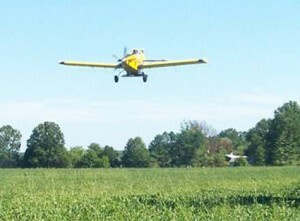 If you are interested in aerial seeding your cover crops, please call our office at (563) 568-2246 ext. 3 for more information. ← View the new educational signs in the Waukon City Park!